McCormick's Creek State Park features two group camps, Camp McCormick and Camp Na Wa Kwa, that are available from April through October. Each group camp accommodates 100 people in 4 sleeping barracks that have electric lights, 4 electrical outlets, a smoke detector, modern toilets and no heat. Each barrack sleeps 25 people in 13 sets of bunk beds (no pillows or linens provided). A central shower house is shared by both group camps (no towels provided). 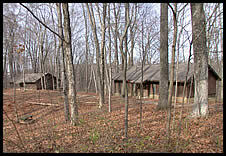 Both camps contain separate accommodations for the cooks and leaders. The Cook's Cabin sleeps 4 (in 2 sets of bunk beds) and includes 3 electrical outlets, a smoke detector, and no heat. The Leaders' Cabin sleeps 4 (in 2 sets of bunk beds) and features 4 electrical outlets, a smoke detector, and no heat. Each camp also includes a large capacity dining hall that seats 100 people. The commercial kitchens are equipped with commercial size gas stoves with 6 burners, griddle top and 2 ovens, grills, walk-in freezers and refrigerators, and sinks with hot and cold water, commercial can openers, stainless steel tables with shelves, 2 electrical outlets, coffee makers, and modern toilet facilities. In addition, all utensils, dishes and silverware (no towels or cleaning supplies) are provided. There is also an amphitheatre in the area that is shared by both camps. Contact the park for information on its use. Check-In time is 3:00 pm. Check-out time is 12:00 noon. Group Campers may not hang, tape, staple, or otherwise affix anything to the facilities. Each group must clean the group camp and shower house before departure and must contact the park office before check-out for final inspection of camp facilities. Fires are allowed only in designated areas. Non-smoking areas must be observed. Group campers must pay the initial gate entrance fee. Then gate passes will be given to group campers for the remainder of their stay. Pets are not allowed in group camp buildings or area. Must be 21 years of age to rent. No other camping units are allowed in group camps.